with ferns, alyssum and verbena. 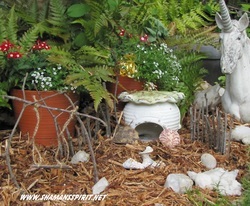 Many years ago, I made a fairy garden in a quiet corner of my yard. It was very simple, some beautiful ferns, a homemade fairy house, and a pebble walkway. It was such fun to imagine the fairies discovering their new home! The great thing about creating a fairy abode is that there are NO RULES!! They can be as simple or as elaborate as you wish. Many craft stores carry fairy accessories but I always found it such fun to make my own rustic decorations. I’ll outline here the supplies necessary to build your own fairy garden and invite the fae folk into your own yard. First, assemble your supplies…a container (if your garden is to be portable), soil, plants and accessories. 1. Decide where your fairy garden will be located. Mine is in a quiet corner of my yard but portable gardens are also very popular. You might choose a flower pot or other type container, a terrarium, or a hollow tree stump. Anything that holds dirt may be used as a home for the fairies. If you are planting a container garden, fill your chosen pot with soil. Be sure there is a drainage hole in the bottom of the container. The type of plants you use will depend on the location of your garden. Herbs such as bush basil, curly parsley, creeping thyme and chives are suitable for a mid-sized container. Other choices are various kinds of moss, sedum, mini-ferns, ajuga, pennyroyal mint, roman chamomile, rose moss, violas and alyssum. For my in-ground garden, I chose ferns, coral bells, apple mint and creeping phlox. Check with your local garden center, they will usually be able to guide you in the appropriate plant choices. This is the fun part! Go on a scavenger hunt around your home for small items to use. Shells, sticks, pebbles, popsicle sticks, and tree bark become tiny houses, gravel pathways, fences, furniture….let your imagination be your guide! Fae folk also love sparkly, glittery items! 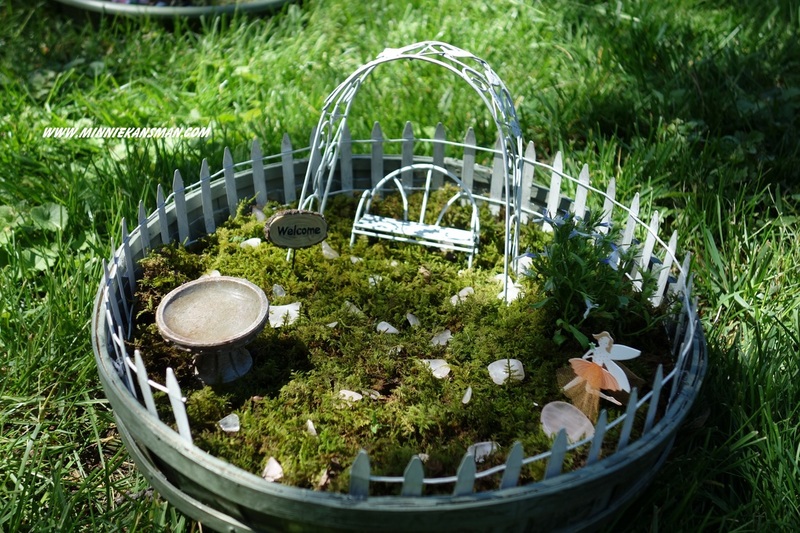 Check out the fairy garden photos I’ve included. Give your kids free rein to create their perfect fairy abode! 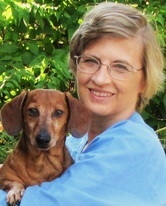 You will be amazed at their creativity in making a comfortable home for their new friends. for every boy or girl. Just imagine it! Your personal fairy is waiting patiently for you….just outside your door…can you hear their playful laughter?